A designer in Oregon has come up with a new design for the rainbow flag, and xe’s looking for funding on KickStarter. Daniel Quasar is proposing a new, “progress”-focused design for the rainbow flag. The design puts white, pink, light blue, brown, and black stripes in an arrow on the left on top of the six-striped rainbow flag. The light blue, pink, and white stripes on the left come from the transgender flag. 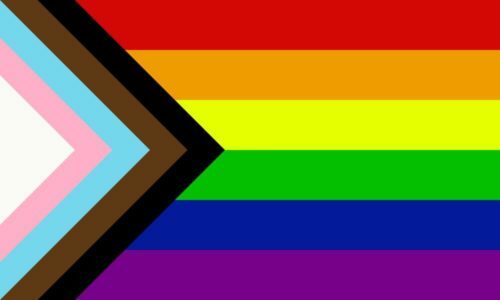 The brown and black stripes represent people of color, “as well as those living with AIDS, those no longer living, and the stigma surrounding them,” Quasar writes. Xe said that xe was inspired to design the new flag when the Philadelphia Office of LGBT Affairs displayed a version of the rainbow flag with brown and black stripes to represent people of color. “I felt there needed to be more thought put into the design and emphasis of the flag to give it more meaning,” xe wrote on Facebook. Xe is trying to raise $14,000 on KickStarter, mostly to produce nylon flags that are three feet wide and five feet long. Xe has received almost $3000 so far. Quasar identifies as a “queer non-binary demiguy” and prefers xe/xem/xyr pronouns.